AbsenceSoft manages employee leaves, including FMLA, short-term disability and long-term disability as well as ADA accommodations. We have built a platform that makes managing FMLA, STD and LTD leaves and ADA accommodations easy and compliant. Workflow configuration is intuitive and simple. Policy updates and workflow changes are made effortlessly. Our communications features are best-in-class so you can manage leaves efficiently while seeking to improve worker productivity. You might even jump for joy. We’re completely fine with that. AbsenceTracker™ is designed by HR pros with YOU in mind. We know tracking employee leaves, absence management and ADA accommodations can be overwhelming. We’re here to help. Our software is beautifully designed, and our customers rave about how easy it to use. Navigate intuitively between tasks and configurations with confidence. Securely access your information from anywhere. We’ve built our software so you can change and configure workflow to your heart’s content. Our value is outstanding. Regain hours in your day with easy-to-use communication tools and robust tracking. We keep up with changing laws and rules so you don’t have to. We’re more than a vendor—we’re your partner. Our customers receive support from HR pros who know how your job works from the inside out. 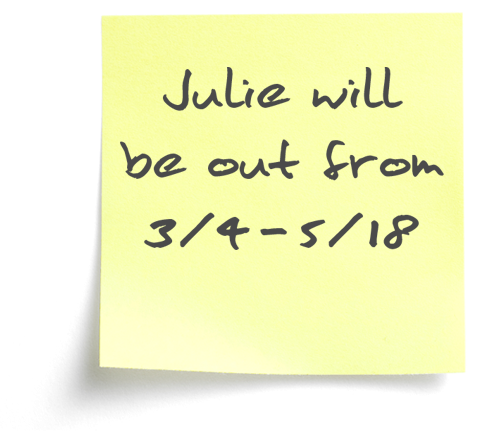 Are you still tracking employee absences with a spreadsheet and Post-it® notes? We think there might be other things you’d rather do. We'll help you reclaim hours each day so you can focus on strategic work and making a difference.